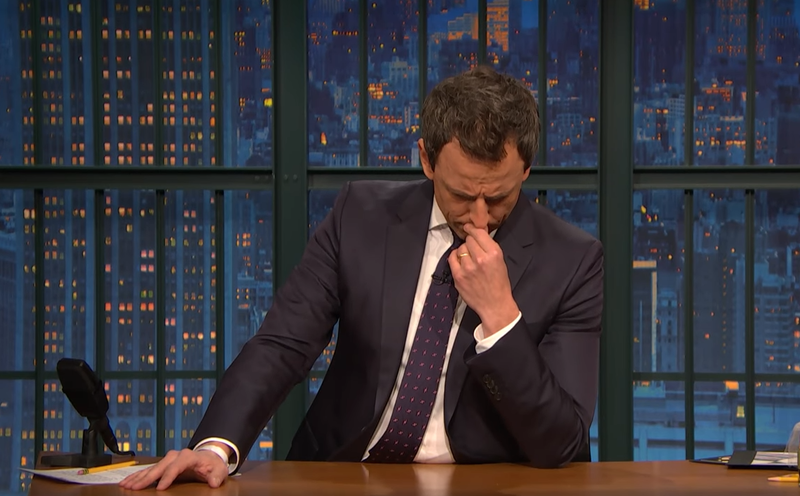 Seth Meyers Tells Story Of His Wife Giving Birth In Their Apartment Lobby. Any woman who has given birth can tell you, once the baby is coming, there’s no turning back. 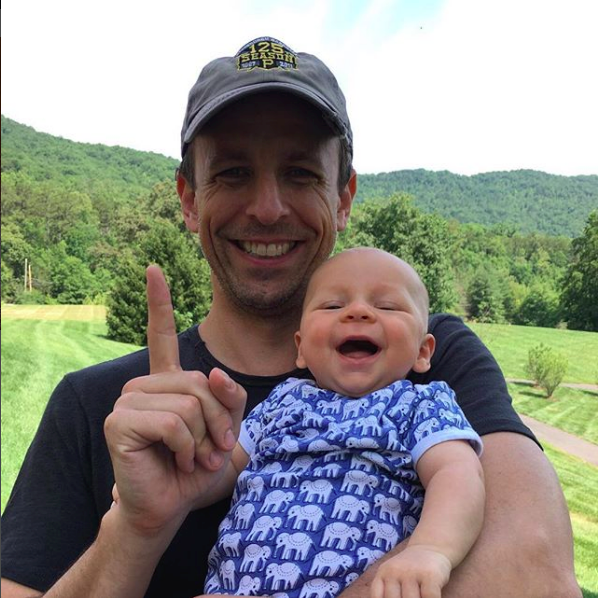 On the April 9 episode of “Late Night,” host Seth Meyers took some time to tell the hilarious and dramatic story of how his second son, Axel, entered the world. 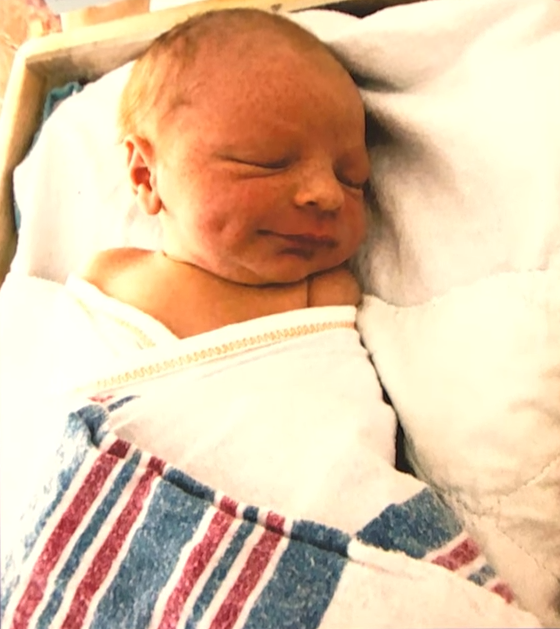 Using his trademark mixture of humor and emotion, Seth explained that his wife, Alexi, had almost had their first son, Ashe, in the Uber car on the way to the hospital. 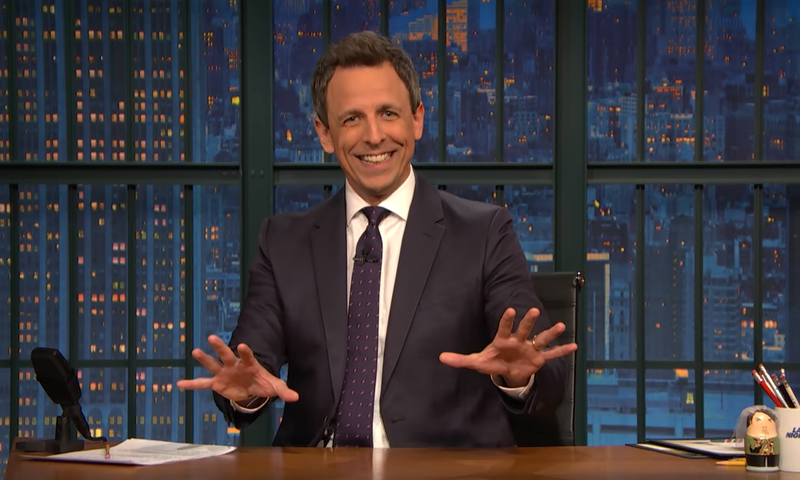 “Well, move over, that story… ’cause that’s so normal compared to what happened yesterday,” Seth said with a grin. Alexi seems to be among the estimated two percent of women who experience precipitous labor, which means the baby comes within three hours of feeling the first contractions. Although they made it to the hospital for Ashe — barely — they weren’t quite so lucky the second time around. Seth explained that he and Alexi knew that labor had started, but they went home to their apartment in New York City to prepare, make calls, and feed Ashe his lunch. As Seth was tending to his son, his mother-in-law Joanne came into the kitchen. 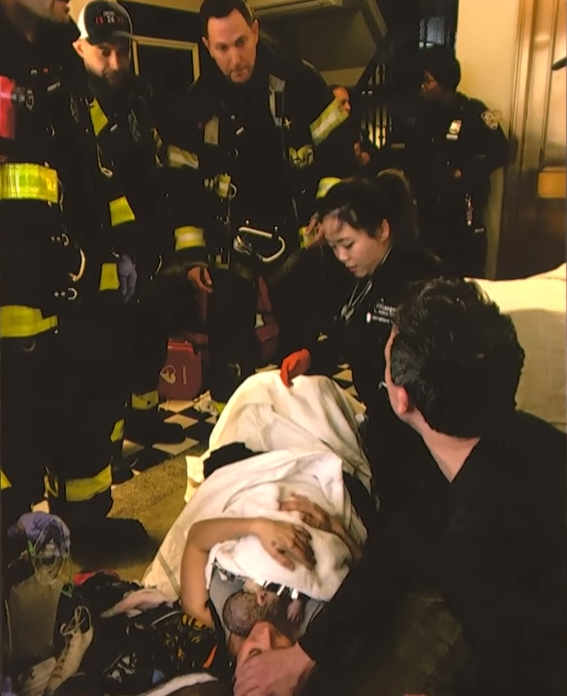 Still not understanding the severity of the situation, Seth handed off Ashe to his sister-in-law and headed down the elevator with Alexi, Joanne, and their doula. 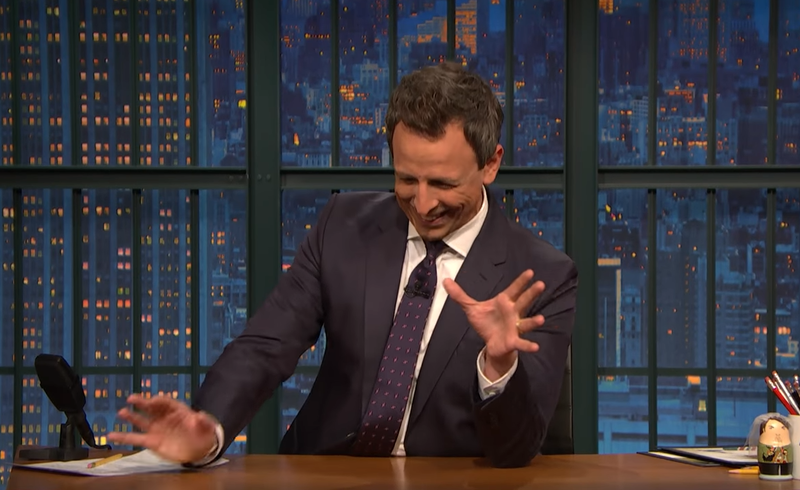 At this point, Seth explained that Alexi was in agony, but the car was waiting downstairs and he still had every confidence they’d get to the hospital in time. But this baby had other plans! Before the group could even make it across the lobby, Alexi couldn’t stop her body from doing what it knew it had to do. All joking aside, they realized that this baby was not just on his way — he was already here! Who needs a hospital, anyway? 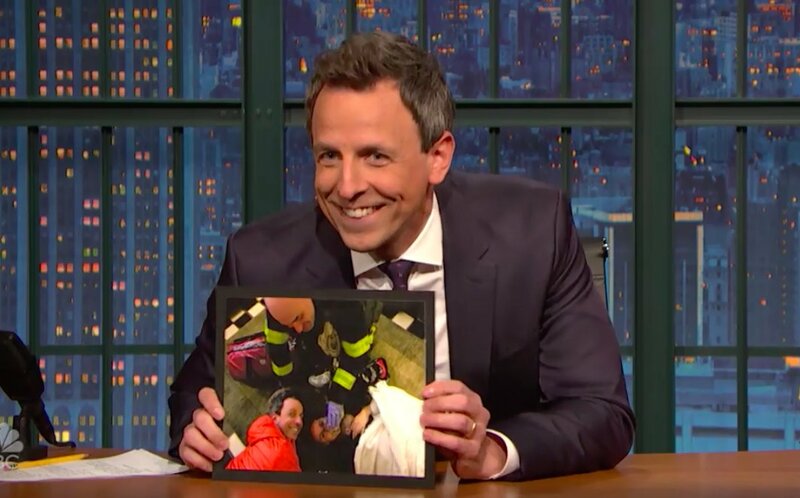 Seth praised the building’s doormen who managed the crowds of curious onlookers, the New York firefighters, police officers, and EMTs who responded to the scene, and his neighbors, who all went above and beyond to help any way they could. A few of his neighbors even warmed towels in their dryers to wrap up the baby. Isn’t that so thoughtful? Seth had kind things to say about everyone… except the Uber driver, who charged him for the ride they never took. Looking back, however; that driver really dodged a bullet! 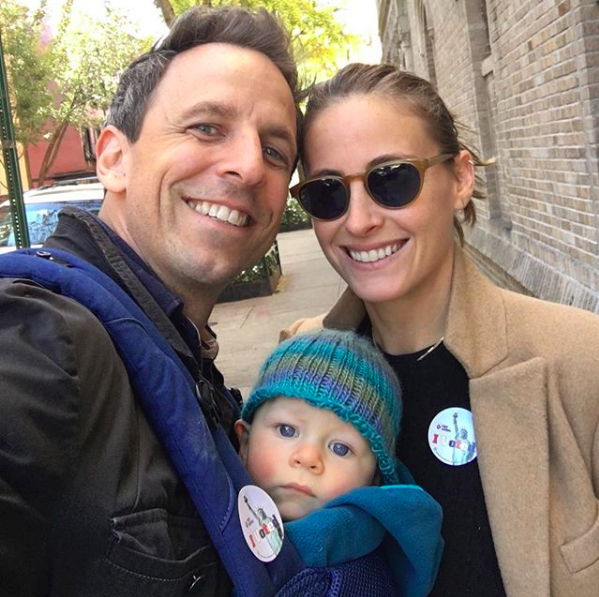 Seth explained that the baby’s name, Axel Strahl Meyers, was chosen to honor his wife’s grandparents, who were Holocaust survivors. This experience reminded him more than ever that the sacrifices we make today reverberate throughout the generations. Just look at him — he’s already smiling! He seems pretty satisfied with himself for arriving so quickly. Mostly, I just want to thank my wife, who obviously has to get an apartment closer to the hospital. But she’s so amazing. The speed with which she took this guy and had him on her, I was just watching her and I thought, ‘That kid’s gonna be fine forever because of her. She’s really amazing. “I still get choked up thinking about how brave I was,” Seth joked. What a story! Congratulations, Seth, Alexi, Ashe, and family! 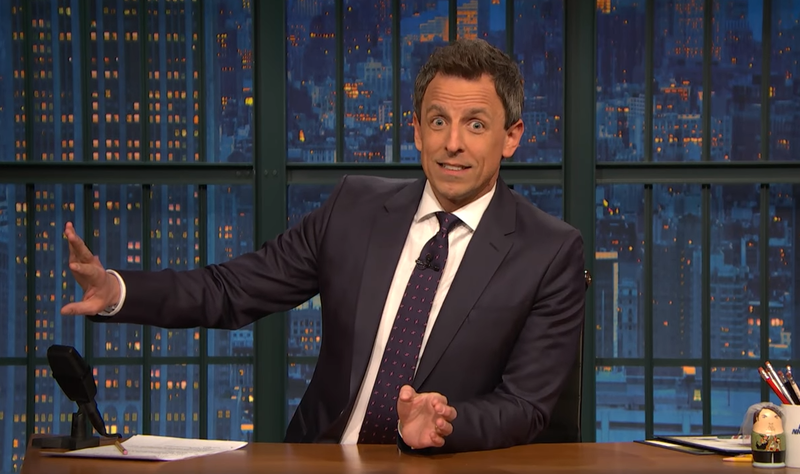 Watch Seth’s hilarious and touching monologue about Axel’s birth, below, and be sure to share to make someone smile today!